Do you process EPS, XPS, PU, mineral wool or natural raw materials? LTG filter solutions provide a reliable and cost-effective means of removing dust, fibres and granulates generated in production. For example, when boards made by foaming of polystyrene granules are cut to standard or customer-specific sizes and their edges trimmed, our filter technology is ideal for collecting and separating the resulting waste and dust. The continuous, pressure surge-free cleaning system reliably removes waste and operates with a minimal loss of pressure. For you, this means low energy and operating costs along with dependable operation and high quality. The LTG filter system ensures that no material is lost. The waste which is gathered can easily be returned to production – and even sorted by type. The ingenious filter principle which makes this possible has been successfully applied by many users. Another area which presents special challenges to air technology is the production of mineral wool. High temperatures and abrasive particles put high stress on the fan components. Our fans are up to this particular challenge, thanks to their rugged design, durability and high efficiency. Would you like to optimise your conveyor system or throughput process? LTG tangential fans generate a perfectly even air flow over the entire belt width. Whether your process involves cooling, heating, drying or humidification, we’ll help you to make it more effective. There’s hardly a challenge we’re not familiar with. With our engineering services and broad know-how we can ensure that you have a reliable production process. LTG Filtration Technology products have proved their worth in the construction and insulation sector over many years. Our product range has a modular structure, allowing you to adapt all of the components to your application. Our compact filter unit CFU combines the individual products and can consist of different filter stages depending on the design. For example, these systems can be equipped with a TVM pre-filter unit and a fine filter like the LTG CompactDrum Filter®. Reusable filtered materials are conveyed to the respective secondary circuits, where they are efficiently separated by our ZSA/ZSB/ZSC centrifugal separators, FKA/FKC fibre compactors or CPS compacting power screws. It is also possible to convey these materials directly to a silo or return them to the production process. Our product portfolio also includes LTG fans for air treatment in all designs and sizes. Among those of special importance for construction and insulation materials are our highly efficient LTG axial-flow fans and high-quality LTG centrifugal fans, which are mainly used for conveying primary air. Our conveying fans in the M./5 RU..MS series were specially developed for handling concentrations of dust and fibres in the secondary circuits of filter systems. By selecting special, highly wear-resistant material pairings, we have made them very durable and minimised the maintenance requirements. We also offer LTG tangential fans, which distribute air very evenly over large areas. Finally, LTG's product range includes tangential fans, which distribute air very evenly over large areas, permitting efficient and high-quality drying in conveyor systems or throughput processes. Our engineering services are available if you need help in designing air and heating systems and have to select exact values of parameters that are important for your processes, such as air temperature, heating and cooling capacities, and humidity. We'll work with you to develop an optimum design and verify it using state-of-the-art aids such as computational fluid dynamics (CFD) and tests at our technical centre. 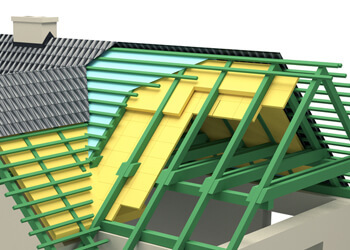 We have worked with customers in the construction and insulation materials sector for many years now. Our filter systems are particularly effective in production facilities for EPS and XPS. Manufacturers of mineral wool rely on our fans as well. Our products have also proved themselves in the processing of natural raw materials like wool.